Trinity College Dublin has announced that one of Ireland's most important and ancient manuscripts, the Book of Durrow, is to go on loan to the British Library for a landmark international exhibition next month. The 1,300-year-old book is a precursor to the Book of Kells and one of the earliest surviving decorated Gospel books in western Europe. 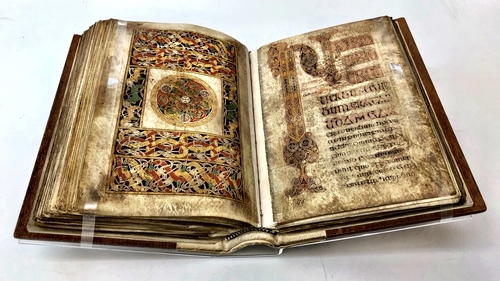 It will join major manuscripts from around the world, such as the Codex Amiatinus, the oldest complete manuscript of the Bible in Latin, in the British Library exhibition ‘Anglo-Saxon Kingdoms: Art, Word, War’. TCD, which has been custodian of the Book of Durrow for the nation since the 17th century, says it is important that educational and cultural institutions continue to collaborate as Brexit unfolds. The Librarian and College Archivist at the Library of Trinity College Dublin, Helen Shenton said: "Through this partnership with the British Library, people will be able to see the Book of Durrow alongside major manuscripts from across Europe and the USA. "It plays a crucial role in telling the story of the Anglo-Saxon period and how it influenced early Christian art; the story simply can’t be told without it. In a Brexit and post-Brexit era it is so important that our cultural institutions continue to collaborate in such significant partnerships." Coinciding with the British Library exhibition, the manuscript has been digitised and a new online exhibition has been developed by TCD. The Provost and President of Trinity College Dublin, Dr Patrick Prendergast said: "This 1,300 year-old manuscript has transcended borders throughout the ages and continues to teach us about the great value of educational and cultural collaborations. "Trinity is delighted to give people an opportunity to view the Book of Durrow in an exhibition of this scale and global importance. As a university this is something that we want to facilitate and be part of." The exhibition 'Anglo-Saxon Kingdoms: Art, Word, War' will run from 19 October– 19 February 2019 at the British Library.